Above ground pool steps have come a long way in just a few short years. Want to see what's new? 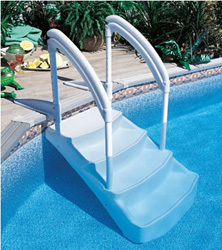 These molded pool steps were originally designed to use with a pool deck. Now just about every model has, as an option, an outside ladder to go with it. 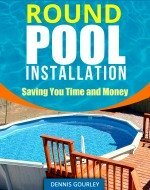 You no longer have to have a deck to enjoy the new and safer way of getting out of an above ground pool. It started with something called the wedding cake steps. Now there are many models to choose from and they keep getting better. Visit the wedding cake steps page for some ideas to get the most out of your pool steps. This model is called the Royal Step. These steps sell for about $175.00. The best part about the new molded design for steps and ladders is that they are so much easier to assemble than the older aluminum and steel versions. Some can be a little more time consuming than others but overall they are pretty simple. They last and stay looking nice for a much longer period of time than the older ladders. An investment like this will last many years. It's always a good idea to use a Ladder Pad when using any type of ladder or steps. Bought 2 one for inside pool one for outside the pool. Love them !! Very happy with the new stairs. Wish they would include the weights for the stairs to stay down. Did add some sand but it wasn't enough had to add weights zip tied to the inside bottom of the inside ladder. My husband & I are in our 70's and needed a ladder to be able to get in our pool and this fit our needs. This is the best pool stair, no worries. The steps are perfect for the new deck of the pool. The steps are sturdy. Not sure how I am going to take them out at the end of the summer but I'll cross that bridge then. Great set of stairs. We used playground sand. We've had them for the 3 years we've had our pool. 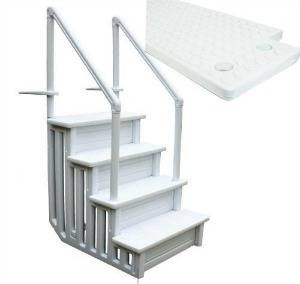 The only thing I would recommend is to buy a pad protector for in back and under the stairs. We just had our liner patched. The stairs are wide enough so a person could be sitting on them and someone can pass them by. It allows me to do my pool exercises with styrofoam weights. Brought 2 one for the inside and one for the outside. They work great. Easy to assemble.